Emily and Jack talk in the hall during the yacht club party. Something tells us she doesn't approve of his decision to date Agent Taylor. 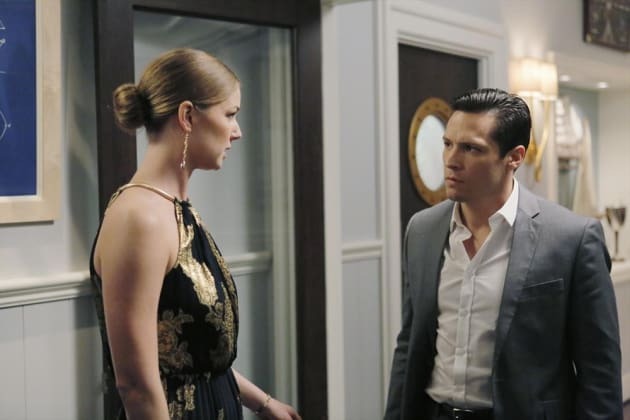 Revenge Season 4 Episode 10: "Atonement"
Kate: I work for the United States taxpayers, Mrs.Grayson. Victoria: Oh, and I do so miss my dearly departed husband! Permalink: Oh, and I do so miss my dearly departed husband! Margaux: I'm not angry. I'm realistic. You're very good at saying the perfect thing when life is easy, but when choices get hard you run away. Daniel: There's only one of us running, Margaux. It's not me. Permalink: There's only one of us running, Margaux. It's not me. Revenge Round Table: RIP, Daniel Grayson!